Danske Bank in Northern Ireland reports a profit before impairments of £92million for the year to end December 2018. Profit before impairment charges is down 22%, however the underlying performance of the business remains strong. 2017 benefitted from two one-off credits – sale of the wealth business and pension changes - so a profit fall in 2018 was expected, despite improved income growth. Total income is up 2% year-on-year reflecting growth in lending (8% higher) and deposits (7% higher) and higher UK interest rates, partially offset by the inclusion in 2017 of income from the proceeds of the sale of the Bank’s wealth business. The year-on-year increase in expenses is primarily due to the non-recurring impact in 2017 of changes made to the Bank’s pension scheme. Underlying costs are 4% higher, given ongoing investment in new customer solutions and skills designed to ensure the Bank fully meets customer needs and expectations. Profit before tax reduced year-on-year, further reflecting a low net loan impairment charge in 2018 compared to the net recoveries reported in recent years. Danske Bank continues to have a strong capacity to support further lending growth as demonstrated by a loan to deposit ratio of 76% as of December 2018. 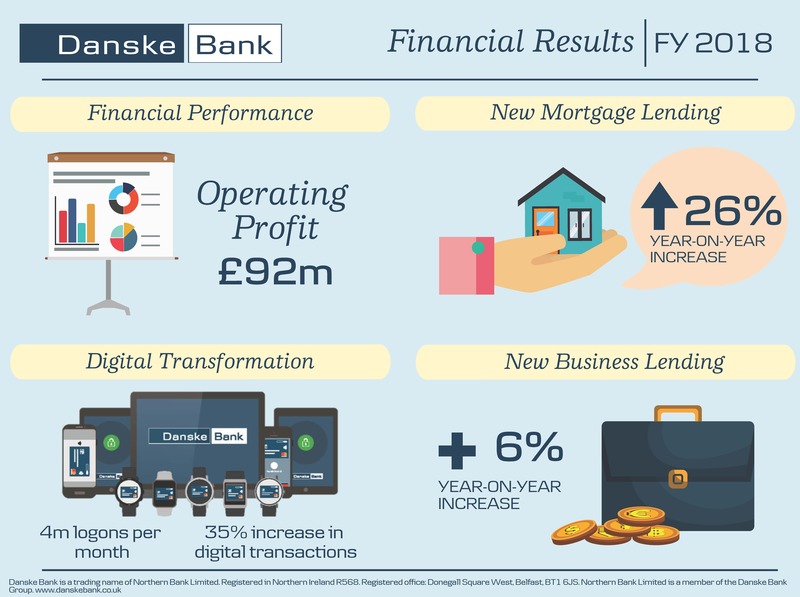 "I am pleased to report an operating profit of £92 million for 2018, with income, mortgage lending and business lending all up year-on-year. "2018 was a strong year for our mortgage business, with new mortgage lending up 26% compared to 2017. We have more mortgage consultants based in Northern Ireland than any other bank, and we set up a new team of relationship managers dedicated to serving the independent mortgage broker network. Latest research indicates that Danske Bank is now providing 1 in 4 first time buyer mortgages and 1 in 5 of all mortgages in Northern Ireland. "We were also delighted to see our customer service recognised, winning the overall in-house contact centre of the year accolade at the inaugural Contact Centre Network Northern Ireland awards. "In 2018 we saw further adoption of our digital channels, with more than 4 million digital logons per month and a 35% increase in digital transactions year-on-year. New offerings included the introduction of a new customer App, as well as new customer mobile payment options - Samsung Pay, Google Pay and Garmin Pay. We are the first of the main local Northern Ireland banks to offer customers all of the main contactless services that are available, having previously also introduced Apple Pay and Fitbit Pay. "We also launched a dedicated fintech co-creation space on the ground floor of our Belfast headquarters – the Catalyst Belfast Fintech Hub. To complement this we introduced thehub.io – an online portal to help the growing number of start-up businesses in Northern Ireland to connect with investors, peers and potential new recruits across Europe. "Another example of ongoing digital investment was our focus on upgrading key branches to make them more digitally interactive and conducive to good customer experiences. Alongside this programme we closed two branches in response to continuing changes in customer behaviour. "In Corporate and Business Banking lending is up 6% year-on-year, as we continue to further strengthen our leading market share in this segment. Some notable deals included funding support for Andras Hotel Group, Novosco, SHS Group, Devenish Nutrition, Westland and kitchen door and component supplier U-Form. "In quarter four of 2018 we announced that on 27 February 2019 we will launch a polymer £10 note into local circulation. It will be the first time the Bank has introduced such a note since, as Northern Bank, we became the first ever UK bank to issue a ‘plastic’ note in December 1999 to mark the new millennium. "Today we have also published our first Northern Ireland Responsible Business report. 2018 was a year in which we worked with the Alzheimer’s Society to become a dementia-friendly bank. We also worked with the NOW Group to become the first JAM card friendly bank – making visiting a branch easier for customers with learning difficulties or communication barriers. We believe the way we do business, is as important as the business we do. This ethos was recognised in 2018 when we achieved Business in the Community’s CORE standard, benchmarking us as the highest placed bank in Northern Ireland in terms of corporate responsibility activity." The macro-economic environment continues to be uncertain as the Brexit deadline approaches on 29 March 2019. Assuming that Brexit occurs in an orderly manner, Danske Bank estimates that economic growth in Northern Ireland will remain modest - moving from1.1% in 2018 to 1.2% in 2019. As the biggest bank in Northern Ireland, Danske Bank remains resolute in its commitment to make more possible for customers and to support the local economy in the year ahead.